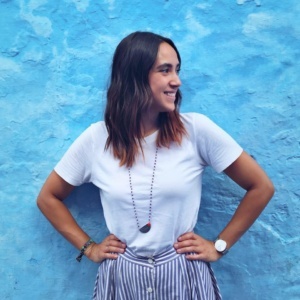 As I write this, sitting in my kitchen with a cup of French press coffee – because a great energy always comes from this place – almost eight months have passed from my first trip to Morocco, and almost two since my last visit. 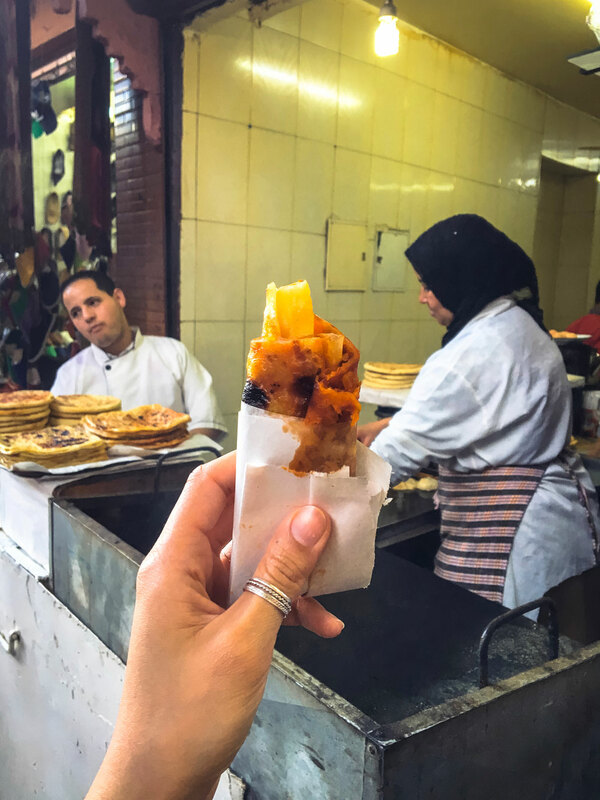 I rarely travel that often to the same country; there’s just so much in the world to see, yet Morocco left me with a deep fascination for its culture, and a wanting for more (of its food, especially). 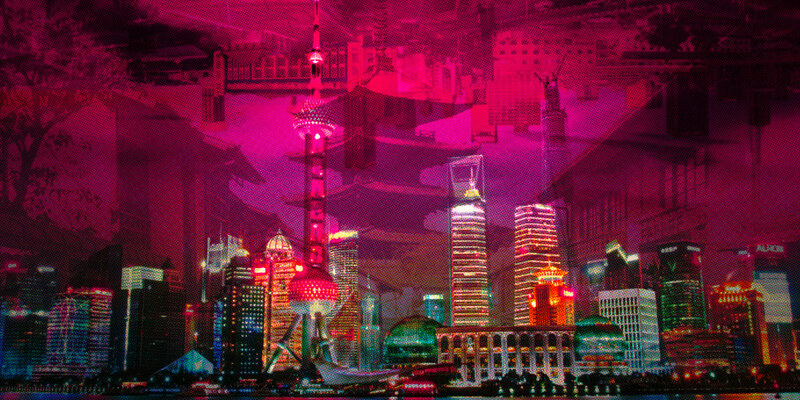 It’s always difficult to give the true sense of a place in a few words, but I will try. For this purpose, let’s play a game together. Read these words; close your eyes; and let your imagination play a movie in your head: the contemplation of the snowy peaks of Atlas overlooking the city of Marrakech; the feeling of ancestral magic and mystery pervading the narrow streets of Fez; the peace and stillness of heart experienced in a Riad’s garden (traditional house built around a central courtyard, converted into a hotel), opposite to the lively and sometimes uncomfortable chaos of the Medina (old city); the spiritual solemnity of the Muezzin‘s call to prayer–echoing from every corner of the sky–five times a day; the soothing ritual of having someone wash and purify your body in a steaming hammam. How do you feel? Let’s try it one more time: the scent of sweet mint tea and its perceivable meaning of hospitality; the fragrant perfume of spices that fills the air of the souk (market); that sticky-finger-feeling when eating honey soaked, nutty pastries and rich dates at the end of a meal, or as a light snack, while walking around town; the smell of freshly baked bread coming from the communal oven down the street; the recognizable tangy, citrusy, concentrated flavor of preserved lemon, in a chicken tajine. And now? Hungry yet? 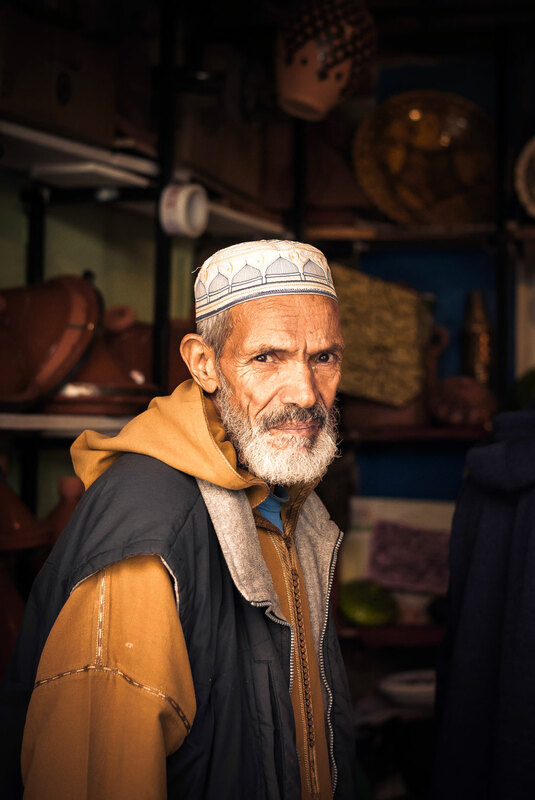 I hope these photos give you a better idea of the Morocco that I experienced in my short travels. 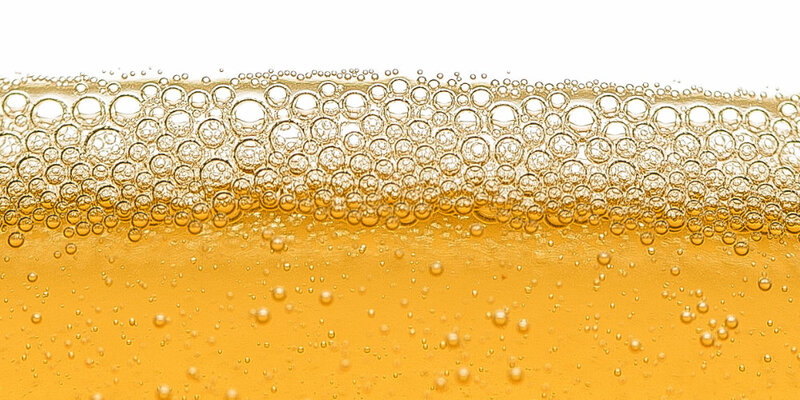 Curious?, find here a recipe for homemaking preserved lemons, my new legal drug of choice. 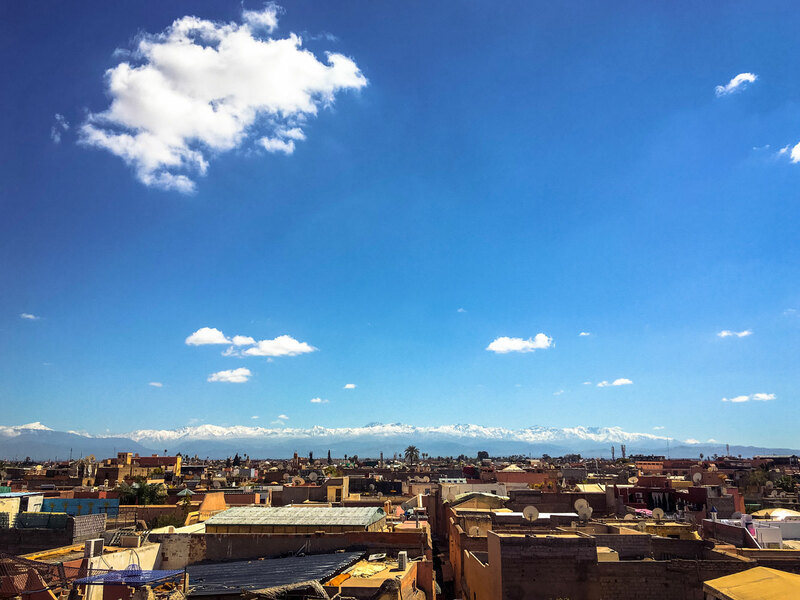 View of the Atlas from a rooftop, Marrakech. 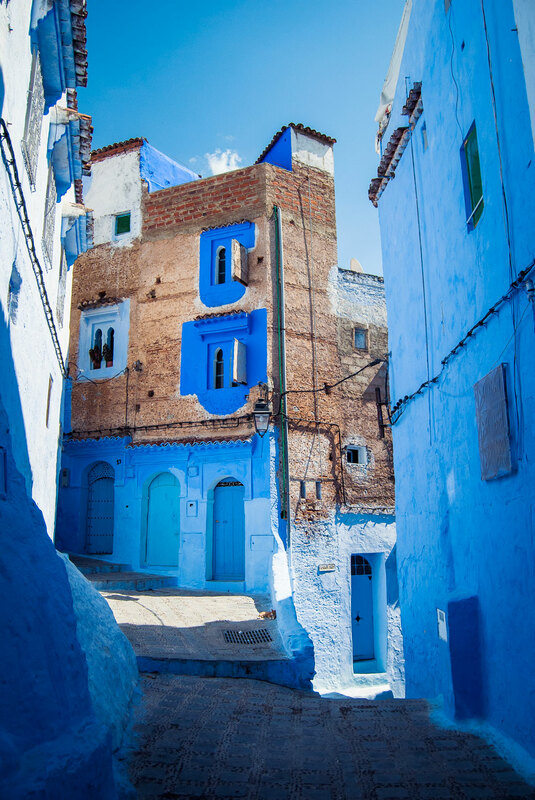 Wandering the streets of the blue city, Chefchaouen. 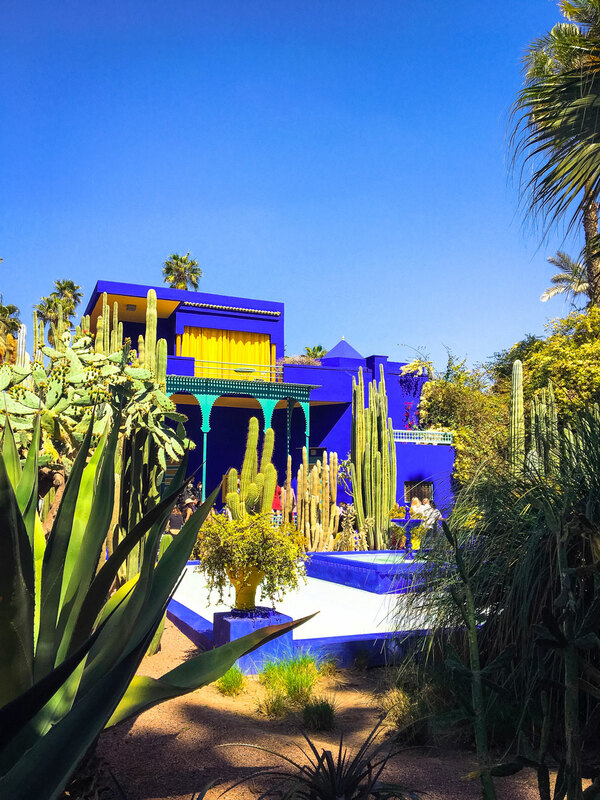 The villa inside Majorelle Gardens, Marrakech. 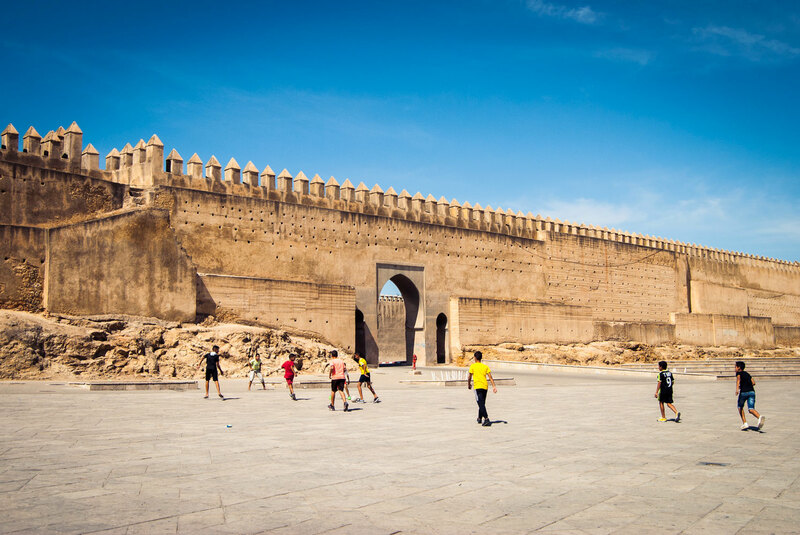 The old walls just outside Bab Mahrouk, Fez. Bread is to Moroccans what pasta is to Italians, therefore the foundation of the table as you can tell by the average price of a white loaf: 0,10€; possibly one of the cheapest commodities in the country. During the food tour with Marrakech Food Tours, I had the chance to visit a public oven. 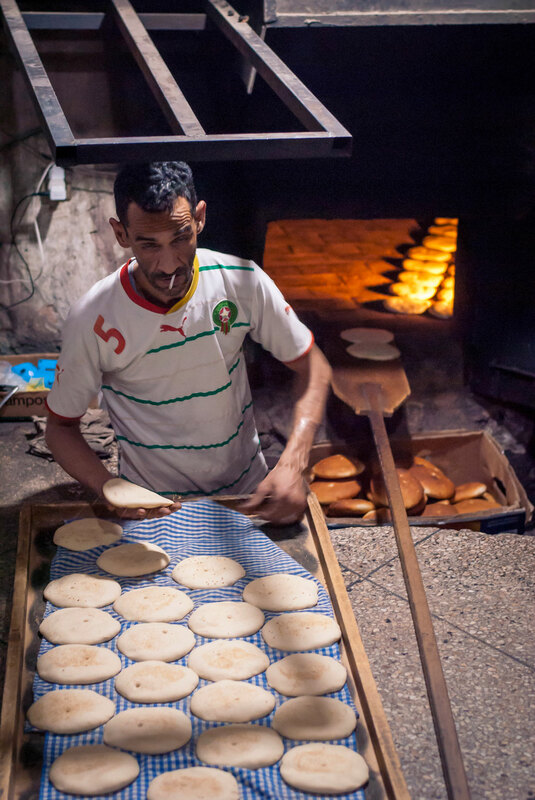 I learned that bakers are highly respected for the great importance of their service to the community and that Moroccan families sent their loaves to bake to public ovens since not all owned an oven at home. This tradition is very much still alive, although most of the bread baked nowadays is for the restaurant business (Marrakech is a very tourism-oriented city, and one shift can produce up to 4000 pieces!). Fun fact: bakers use a toothpick to mark the bread loaves before they go into the oven. 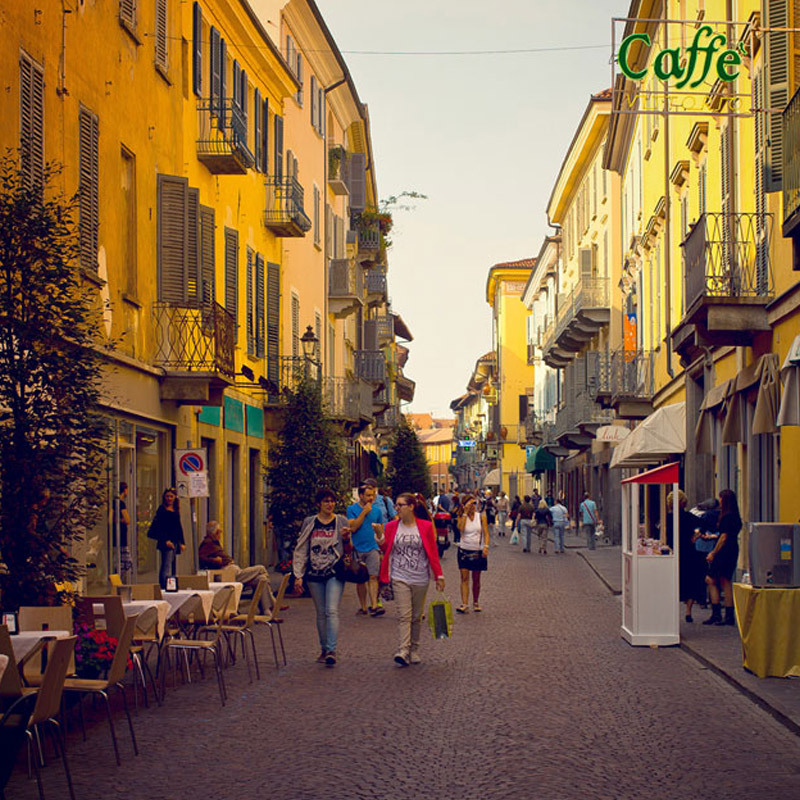 The number of pokes identifies the “owner” of the bread, to whom the loaves will be returned. 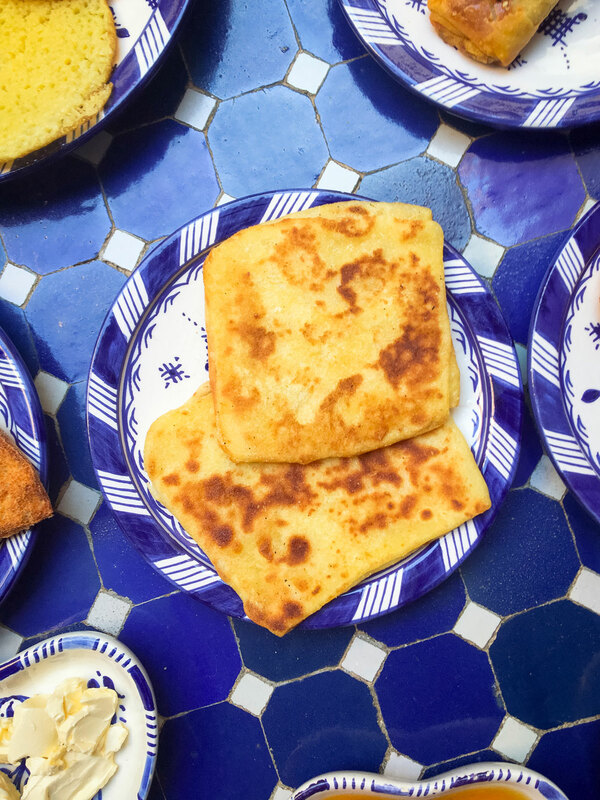 A savory version, and a sweet version of Msemen or Meloui – something between a folded crêpe and a flatbread – served both for breakfast, drizzled with honey and accompanied by mint tea, or prepared by street vendors as a light snack, brushed with a mix of chili pepper and olive oil. Tajine is both the name of a traditional Berber clay pot and the name of the dish prepared in it. These pots are commonly placed directly on charcoals and its content is slowly cooked like in a steam-pot, thanks to its conical lid that seals the pot and preserves humidity. 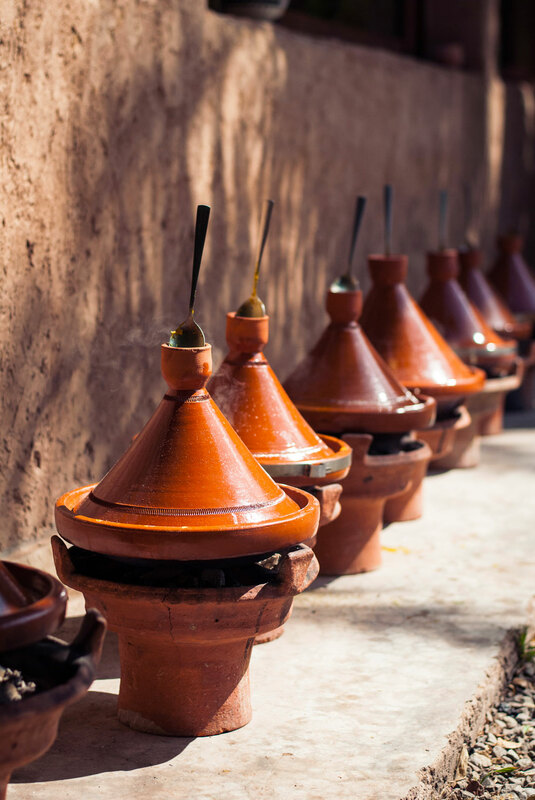 Tajines can be prepared with meat (chicken, lamb, and beef) or vegetables, and even fruit! Each kind will be prepared with a specific mix of spices. A tajine line-up cooking on embers during a cooking class at Amal women’s training center in Marrakech. 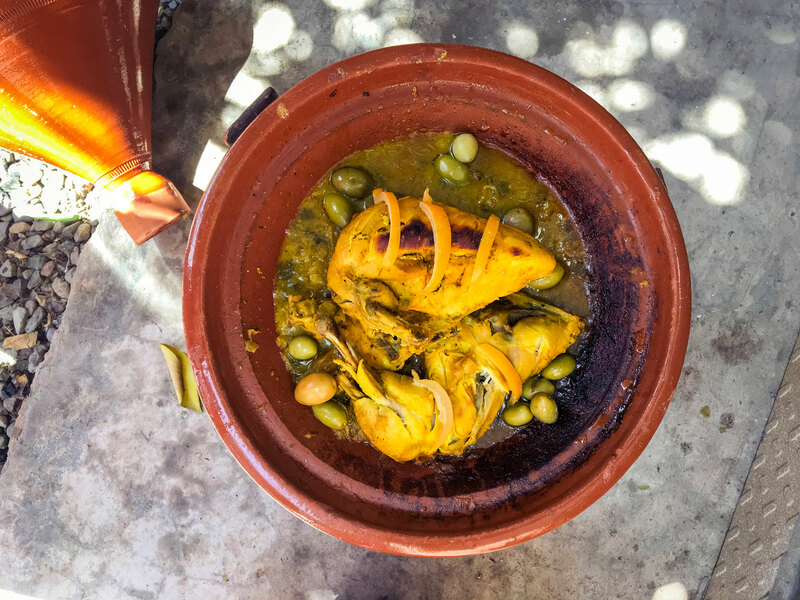 A chicken, preserved lemon and olives tajine. To make this at home, marinate the chicken overnight in a mix of black pepper, ginger, turmeric, coriander, saffron, garlic paste, a little lemon juice and preserved lemon pulp (some rub the chicken with yogurt too, to make it more tender). Simmer the chicken for 15 minutes on medium flame, then add extra virgin olive oil and seed oil, the marinade, flip over, and cook covered for at least 45 more minutes. Finish with the rinds of the preserved lemons and green olives. 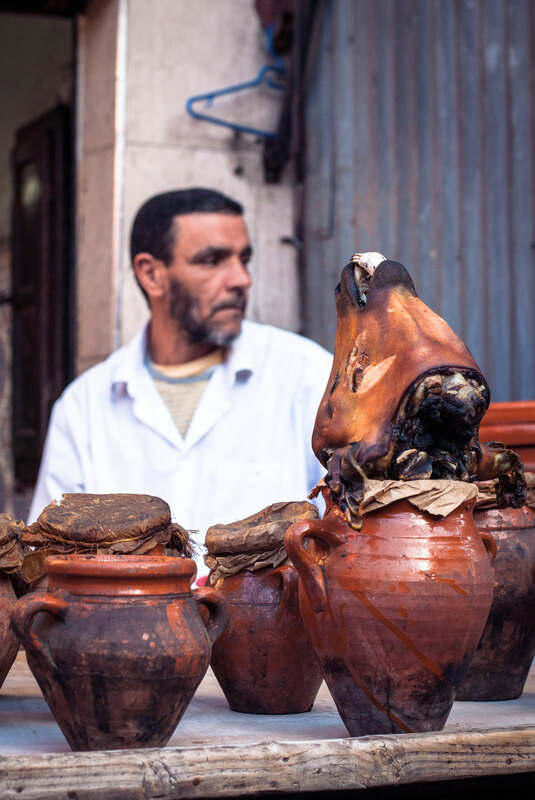 Not to be mistaken for tajine, tanjia Marrakchia is a specialty of Marrakesh, a lamb or beef stew slowly cooked in a clay pot with only six ingredients: meat, olive oil, garlic, cumin, saffron and preserved lemon. 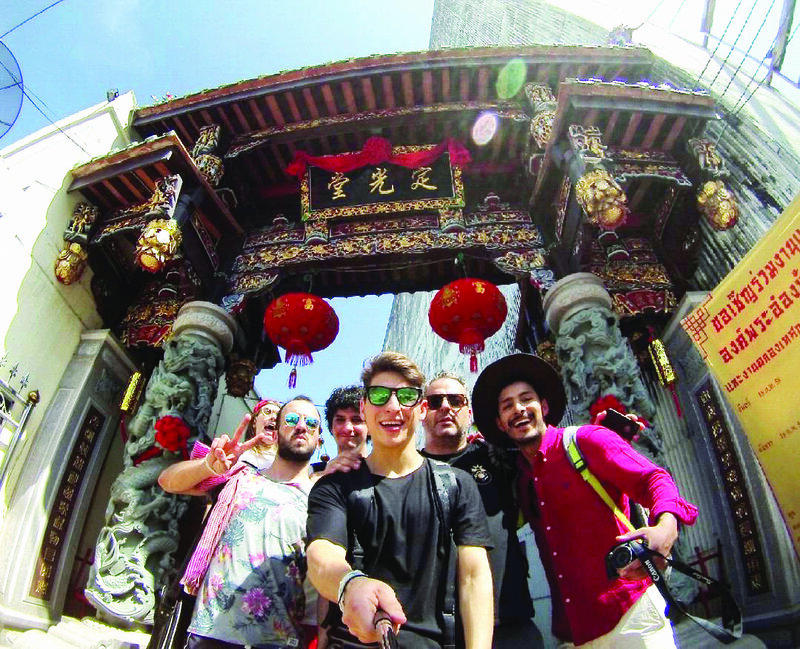 Tucked beyond Jamaa el Fna – the main square in Marrakesh – a narrow alley leads to the last three street restaurants that serve the dish. 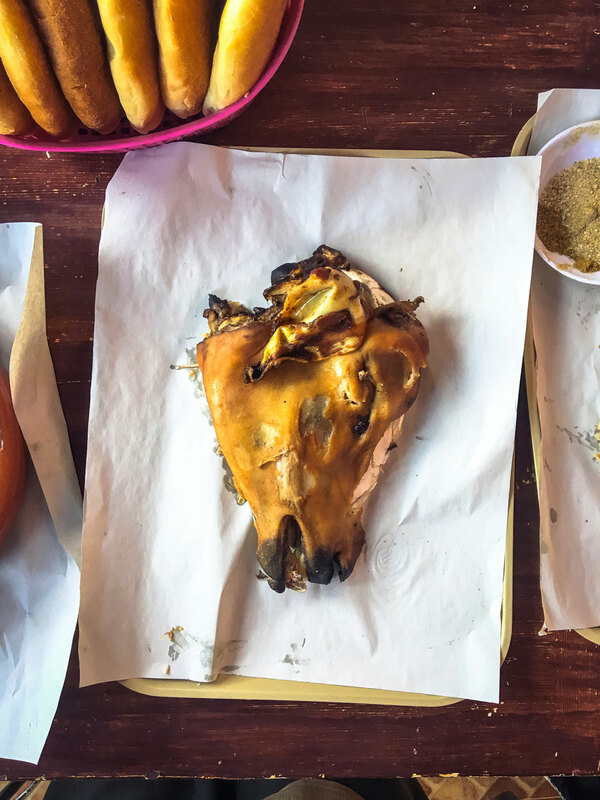 Below one of them is a massive underground oven shared by the families of restaurateurs where other popular dishes on the menu, such as Mechoui (an entire lamb slow-roasted in butter) and steamed sheep’s head, are patiently prepared. 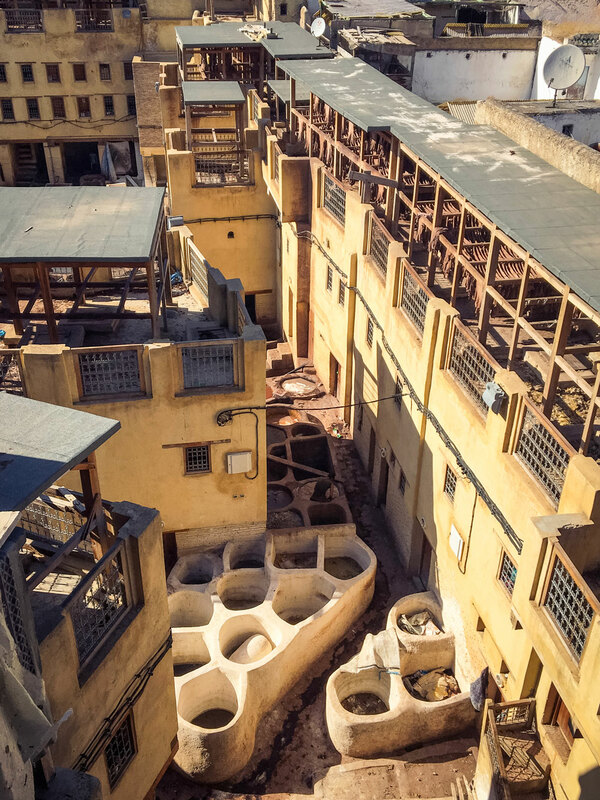 Traditionally, the tanjia is not cooked in this oven but brought instead to a hammam, and the jar left overnight to slowly cook at a low temperature in the ashes of the wood ovens which heat water for the public bathhouses. 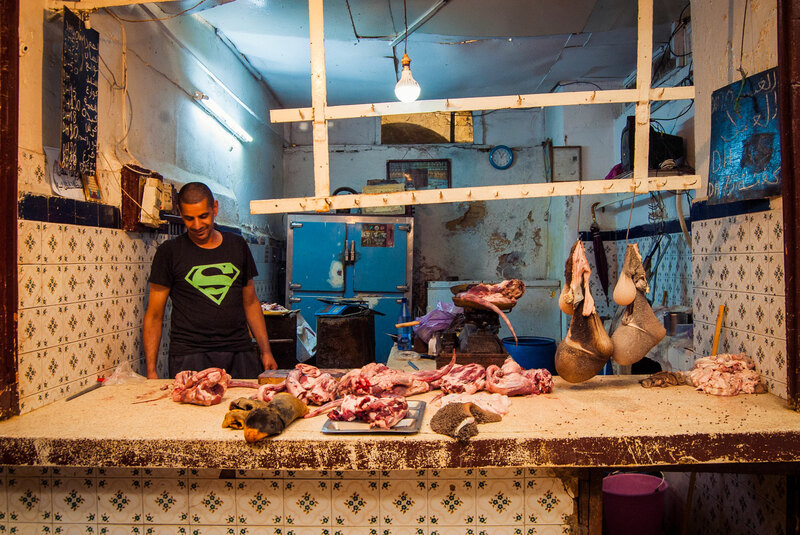 An offal stand in the Mellah (Jewish quarter) of Fez. The clay urns where tanjia Marrakchia is prepared and cooked. 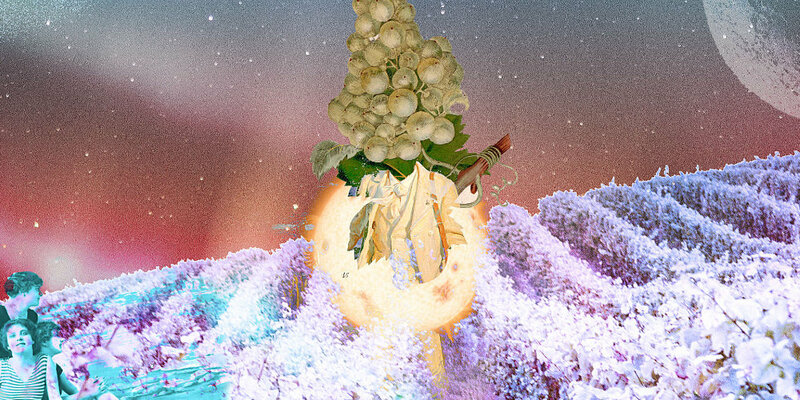 Unlike what I expected, perhaps due to the imaginary of Morocco as extremely warm and desertic, the country is abundant with incredible produce. Fruit and vegetables can be found at roadside stalls in the middle of nowhere, in every alley of the medina, or can be picked straight from the tree. 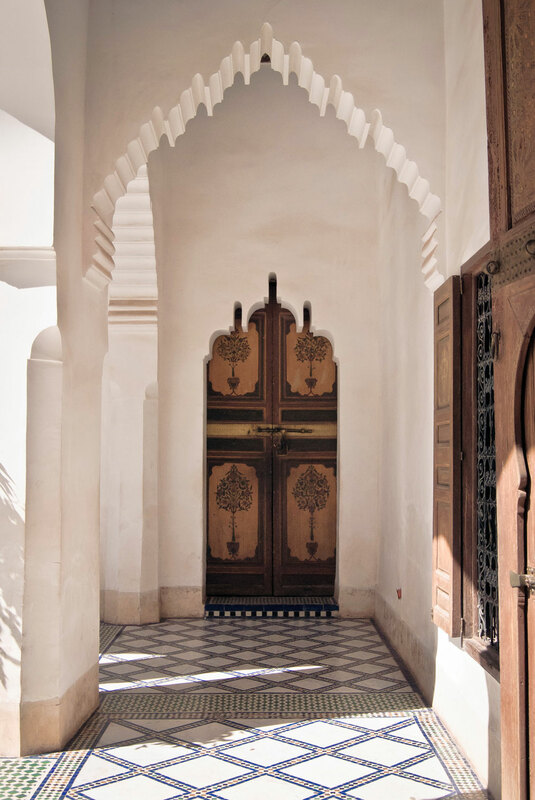 Seasonality is incredibly evident: cardoons, strawberries, prickly pears, pomegranates, oranges, and dates – just to name a few – all belong to a specific time of the year, as I noticed traveling to Morocco in different seasons. Something I absolutely fell in love with, is fresh juice vendors, and milkshake and smoothie shops (among my favorites, avocado, and milk or almond and dates). 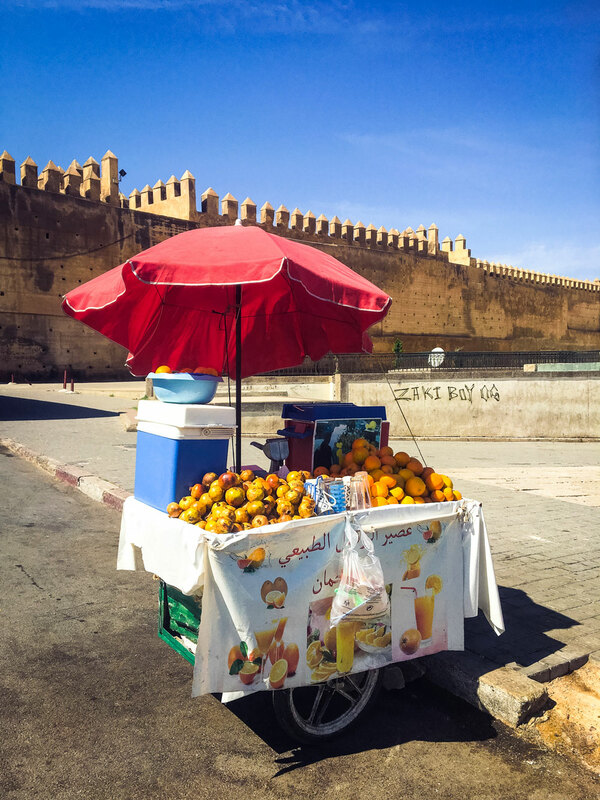 An orange juice and pomegranate juice vendor just outside the old walls of the Medina in Fez. 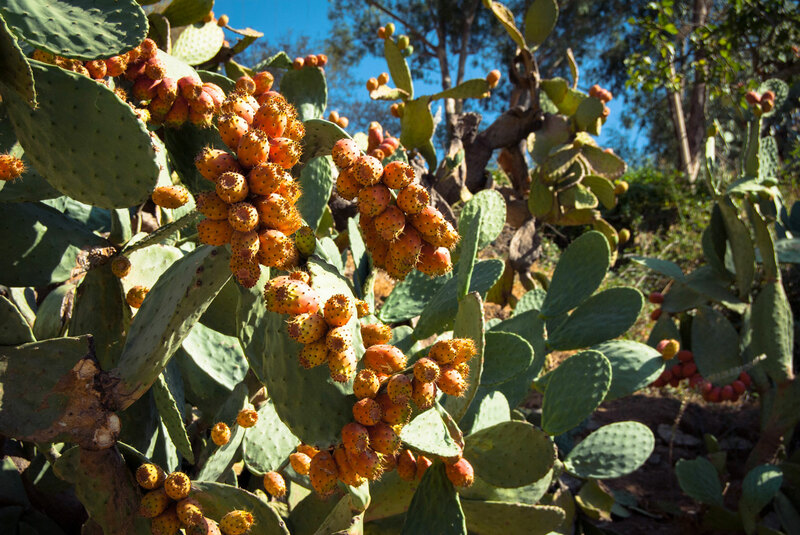 Prickly pears and its cactus from the Rif. 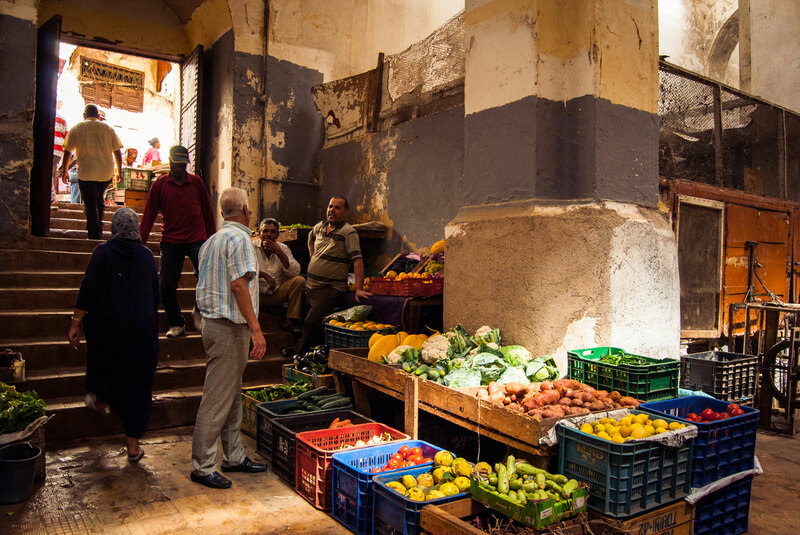 A vegetable vendor inside the Jewish market in Fez. 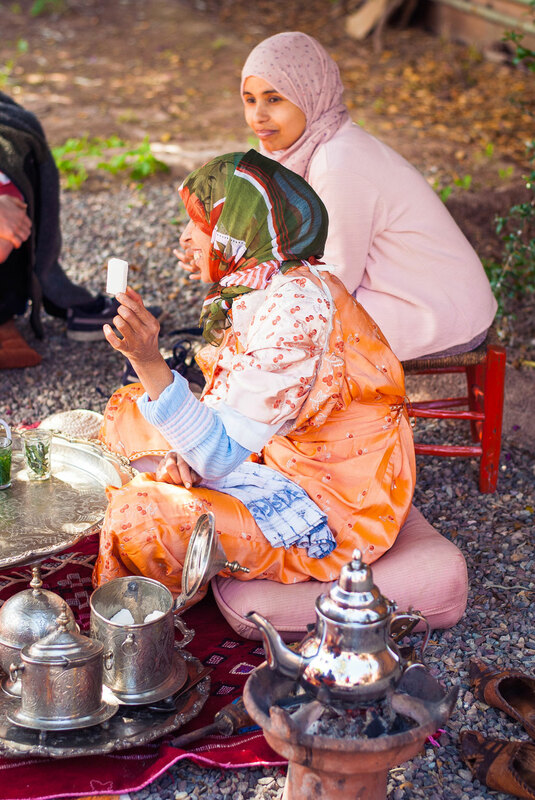 In any way, shape, and form, Moroccans have a serious sweet tooth, and I’ve been told that the amount of sugar that will be poured into your mint tea is directly proportional to your importance as a guest, so consider yourself lucky if you’ll experience a sugar-high! Sugar is not only an essential component of breakfast, but you’ll often find it “hidden” in savory dishes, such as pastilla (a Fassi flaky pastry pie filled with meat, spices, dried fruits, and nuts), tajine, or couscous, in the form of honey, caramelized fruit or dried fruits. Another mention should go to the endless variety of syrup and honey glazed and nut drizzled pastries served after meals or with tea: Chebakia, Feqqas, Ghoriba, Kaab el Ghazal,etc. 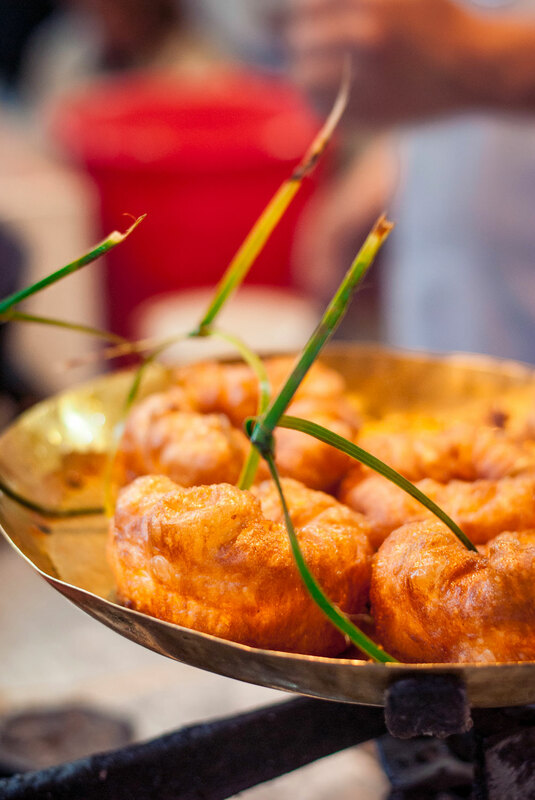 Sfenj– the Moroccan doughnut – served with “fake honey” (simple syrup and orange blossom water), can be bought from street vendors who strung them together with a palm frond for simpler takeaway. Our cooking class training Chef at Amal women’s training center shows us the proper amount of sugar for a Moroccan mint teapot; sugar is used in blocks. 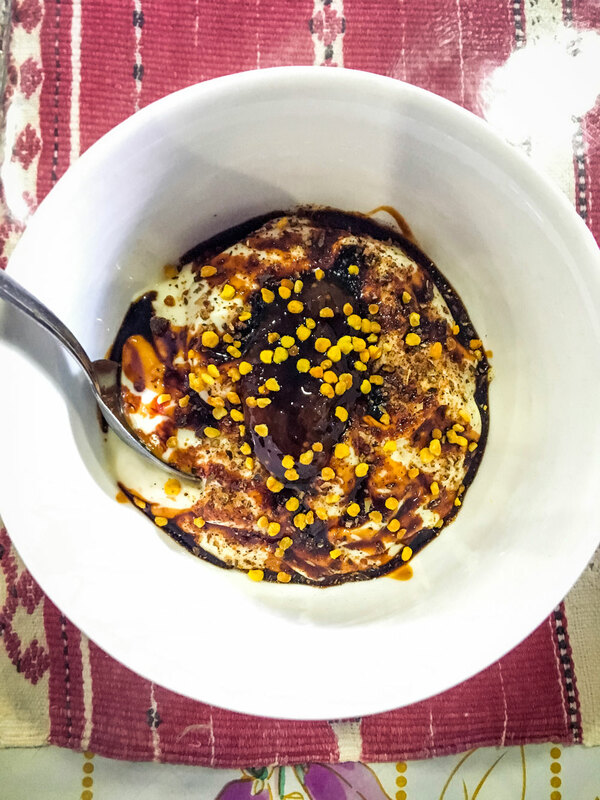 One of the favorite and simplest desserts I had in Chefchaouen: yogurt, robb (date syrup), fig jam, and bee pollen granules.